This unusual science fiction novel takes place in the far future, on a planet of another solar system which was settled by humans many generations ago. Before humans arrived, it was an airless, bone-dry chunk of cratered rock. Now, after terraforming, it is a world of shallow oceans dotted with small islands (the peaks of the craters.) The planet's temperatures are kept within a livable range by a series of gigantic shields (made out of a sort of opaque plasma) which surround the planet, providing cooling shade during the hottest part of the long days, and acting as mirrors which provide light and warmth during the coldest part of the long nights. The people who live on this world have transformed themselves as well. All children are born sexless. As they grow into adolescence, they experience aspects of both female and male, and eventually make the decision to become one or the other as adults (a ritual known as the Choice.) The novel shows the life of the protagonist from birth until the time of choosing. At the time of Choice, a catastrophe destroys one of the shields, leading to deadly heat waves and violent storms which threaten to kill the inhabitants of a large part of the planet. This makes Moonstar Odyssey sound like an action-packed novel; in fact, it is almost entirely an introspective one. The disaster which threatens the planet is shown through the effects it has on the emotions of the protagonist. 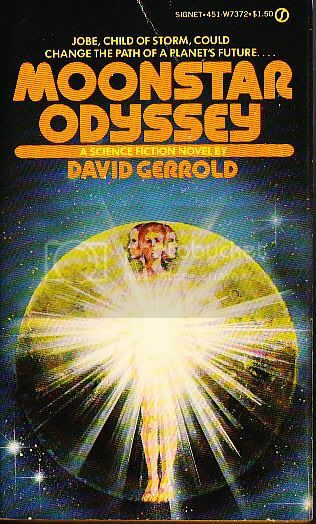 Moonstar Odyssey reminds me of the work of Ursula K. LeGuin, in its exploration of gender and sexuality, and of the work of Theodore Sturgeon, in its lyrical style and endless pondering over the mystery of love. There's also a touch of a "hard" science fiction writer such as Larry Niven, in a section which describes the terraforming of the planet in a detailed, realistic style. This sounds intriguing. Lately Ive enjoyed a lot of books that involve examinations of identity and gender. I'll probably put this on my tbr. What Are Your Thoughts on the Films 2001 and 2010 A Space Odyssey ?